Disk wheels wheel cover clearance? Quote Reply Topic: Disk wheels wheel cover clearance? 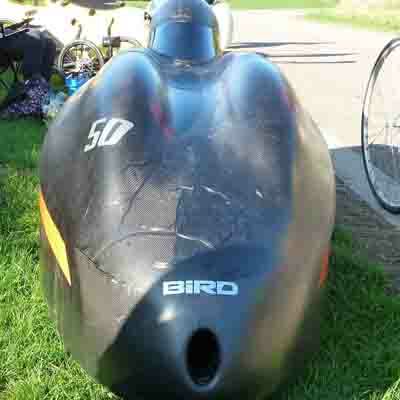 Im really keen to have a go with a aero rear wheel cover on a recumbent bike. Specifically a vittesse bike wheel cover from ebay. The description of these covers states that they are compatible with flat mount disks which isnt what i got. Id still like to try and see if it works with normal disk brake calipers though so i was wondering which type of caliper is narrowest. My idea was to put BB7 brakes on it for simplicity but how do these calipers compare with others in terms of how far they stick out towards the spokes. Perhaps something else is more likely to work? Are hydraulics narrower than BB7's? Ive very little experience of disk brakes so any tips greatly appreciated. I can't advise on disc brake clearances, but I would have thought the covers would be no thicker than 1mm anyway, so as long as you have that, and the dish on the covers is the same as the dish on your wheel then all should be well. Another point is that the aerodynamic "aid" of a disc diminishes as it gets closer to the hub, so trimming it to fit would not have any affect that you could discern. I know a 4-pot Hope caliper is about 19 mm from disc centre to inner face, if that's any help? I've heard it said that drum brakes are more aero than discs if you are starting from scratch. Thanks Roy Yanto and Geoff, Ive bought the wheels already though but hub brakes are one to consider in future. These flat mount calipers that are available for road bikes i suppose would also be more aero than standard ones but need specific frames to fit. By the way does anyone have any experience of Ceconite Aircraft Wing Fabric wheel covers?Where would you get it from and is it tougher than a 1mm plastic one? I have seen you tube videos using model making heat shrink film, it looks ok but is held in place over the rim of the wheel where the tyre sits, now being ham fisted and especially on 20" wheels I can see that being ripped to shreds the first time I try and remove a stubborn tyre. I have in the past, and will making again soon some covers out of 0.5mm polycarbonate sheet, I cut a circle about 50mm larger than the wheel then cut a slot from the centre to the outside edge, this allows an overlap to be formed and gives the dish, marking where it now sits cut out the hub hole, cut outside dia and if you wish cut out the triangular portion that overlaps to give the dish. Mounting is by small tie wraps at the where spokes cross (you don't need to do every one), the two holes are made with a soldering iron, this much harder for the second side so pre bending the ties into a loop aids the threading through the holes. The large diameter at the rim can be held by either hockey tape, electrical tape or many small pieces of overlapping duct tape, ensuring the overlaps are running with the direction of rotation rather than against. You can also use a rattle can to spray the inside of the sheet before mounting to the colour/colours of your choice. Thats great, How do you join the two edges together once triangular piece has been cut out. Is tape the way to go? Or glue? i just use a run of tape. I have tried the edges butted together, and also keeping a bit of overlap, again making sure the overlap is with the rotation not against, the overlap is easiest but possibly not the best, it all depends upon how accurately you can can cut the abutting edges.